Welcome to eisbachwelle.de – your news platform and digital magazine about the Munich Eisbach river surfing community – brought to you by local surfers of the Eisbach river wave in Munich. Let us entertain you with stories about those being inspired, driven, and motivated by the Eisbach river wave – grommets as well as experienced locals! eisbachwelle.de reports and comments on what’s happening in the growing Eisbach community. Enjoy all news and entertaining articles on surfers, river surfing, surf crews, artists, and local brands. Follow us! Get tips and links to websites and projects inspired by the Munich Eisbach river wave, including events, product developments, movies, books, and other publications. The Eisbach river surfing community is growing – since 35 years. 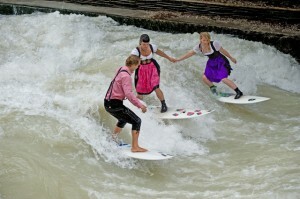 Surf´s up in Munich, capital of river surfing! Load river surfing image, then right click, and select “little planet view” – you´ll be stoked! But far away from any ocean? At 519 meters above sea level? In a pulsing city with breathtaking views at the peaks of the Alps instead of the horizon? In a country that is not (yet!) in the spotlight of the world of surfing? Doesn’t sound real? The river wave “Eisbach” in the city center of Munich is. And this is where Munich holds one´s breath. Urban professionals of close by companies and government agencies, inhabitants as well as tourists on the way to Munich´s finest shopping area, school kids during a break, students between lectures at Ludwig-Maximilian-Universität, culture fans coming from the Haus der Kunst, the Bayerische Nationalmuseum, and the Archäologische Staatssammlung, couples on a romantic walk through the Englischer Garten, native Bavarians in traditional Lederhosen on the way to the beer gardens, and party freaks from nearby clubs and bars from dusk til dawn – everybody stops at the Eisbach river wave. This is where all comes together. The sound of the whirling waters of Eisbach drowns everything else out. A fire engine with screeching siren seems to be so far even if it is just an aerial above the wave on 6-lane Prinzregenten Street. The swoosh of the white water is stunning. The strong current of the water catches the eye. Time seems to stand still. All concentrate one´s attention on: The Wave. How comes? In the very heart of Munich? The Eisbach river wave is pure energy. The Eisbach wave has magical attraction. In Munich at the foot of the Alps far away from any coast there is a surf community growing since the mid 70ties. Well protected for decades, this unique treasure only recently has become very popular. Today, this river wave and its river surfing community is known worldwide. International surf tourists, big wave legends, and some of the world´s best professional surfers travel to Munich, meet local river surfers, and experience river surfing on this unique wave. Kelly Slater, Gabriel Medina, Gerry Lopez, Shaun Thompson, Ross Clarke-Jones, Marlon Lipke and more pro surfers have already been to Munich. Swatch flew in pro surfer Conan Hayes to produce a spot at the Eisbach. Surf sound guru Jack Johnson used a video of him river surfing at Eisbach to promote his latest album on youtube. Eisbach river surfing in Munich – a unique experience! Since the 70ties! Overwhelmed by all this amazing river surfing action you have already seen in videos on the internet or in the river surfing cinema movie Keep Surfing? Well, check this footage: some of the very old and very first stuff! Eisbach Munich River Surfing in the early 80ties. Enjoy! There are always surfers at the Eisbach river wave: in summer with board shorts; and in winter with thick neoprene braving icy water and frozen shores: “Ice Brook Wave” – the name “Eisbachwelle” speaks for itself. Nevertheless, there are river surfers anytime during the day and in the darkest night – more often than not at night surfers bring spotlights driven by generators. Surfing round the clock throughout the whole year. Every single day one ride follows the next. In between there are just seconds. Even a short ride feels like a long wave because the current of the Eisbach is so powerful and fast. The wave is just 12 meters wide but it peels forever. It simply does not stop breaking. The Eisbach river wave in Munich most probably is the world´s most surfed wave! And to all those who prefer watching: Where else can you watch surfers in action this close without getting totally wet? River Surfing at Eisbach Munich is great fun – Smile! 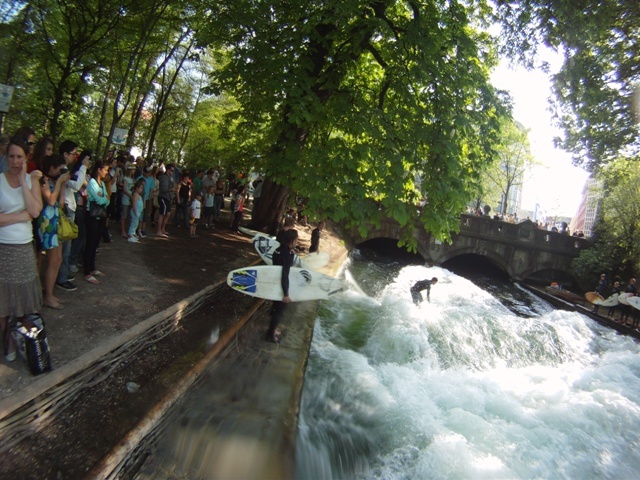 Every day lots of surfers and even more spectators enjoy river surfing at Eisbach in the center of Munich. Loads of photos and videos are taken every day and published in media. Photos, videos, 3D panorama shots, books, advertising spots, TV reports, and cinema movies - they all seem to proof Eisbach river surfing is a unique phenomenon, pure energy, and great fun. Local brand pipelinepictures produced the high-end cinema movie Keep Surfing about river surfing. Producer Björn Richie Lob is a local river surfer at Eisbach himself. His movie focuses on Eisbach Munich – the origin of river surfing. 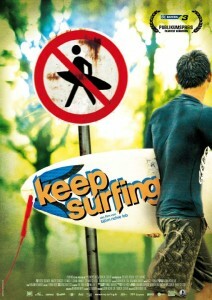 Keep Surfing is winning lots of awards at well known international film festivals. In Germany it already made it to the cinemas in 2010 attracting loads of visitors curious about river surfing. 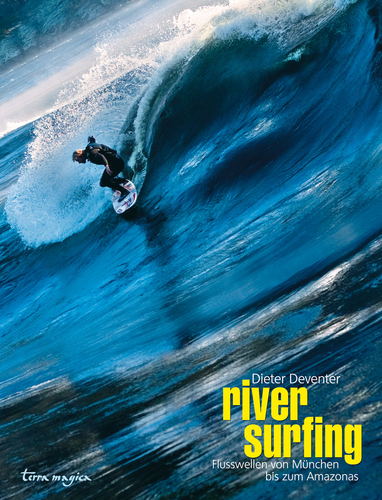 Dieter Deventer has been river surfing in Munich since the mid 70ties – he is one of the first river surfers in the world! Being an artist and a passionate surfer it was only a question of time that he published this photo book on river surfing. The river surfing photo book is available since February 2011. Posted: June 23rd, 2011 under river surfing.